This chapter considers in greater depth the function of victimhood in the politics of memory and in transitional justice. It proposes that victimhood is a category that is subject to multiple constructions by different social systems and that Niklas Luhmann’s social systems theory provides a suitable theoretical framework for understanding such competing constructions and the interaction of the relevant systems around this topic. 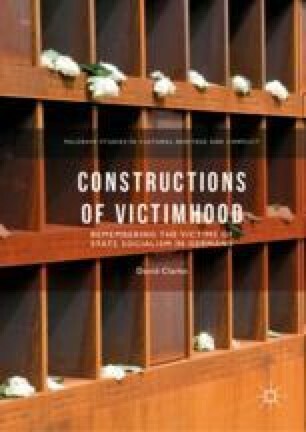 The chapter considers the role of the political system in the construction of victimhood and argues that victims’ organizations can be best understood as organizations of the system of protest that seek to secure recognition for their members. In communicating about the situation of their members, however, victims’ organizations are caught between the need to be heard by the political system and the need to maintain a moralized protest communication that maintains the mobilization of their members. United Nations (General Assembly). 2005. “[Resolution] 60/147. Basic Principles and Guidelines on the Right to a Remedy and Reparation for Victims of Gross Violations of International Human Rights Law and Serious Violations of International Humanitarian Law.” https://documents-dds-ny.un.org/doc/UNDOC/GEN/N05/496/42/PDF/N0549642.pdf?OpenElement. Accessed August 9, 2016.